You have to do Gaudi, right? Casa Batllo is really neat and you really need a jump the line admittance it is jammed .La Pedrera is fascinating but this tour does not go inside, and if you don't go in there on your own or in a separate tour you are going to miss something special. There was a stop to see the exterior of another Gaudi designed house that while interesting resulted in being engulfed in city traffic on one way streets. That combined with a delayed start in the van from La Pedrera ate into our schedule.. These factors made the visit to Park Guell rushed. 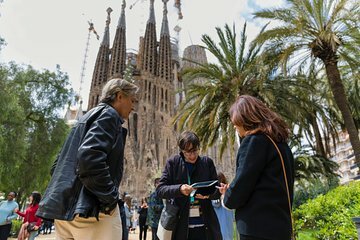 It is a unique place that deserved more time than we had because the admittance time for Sagrada Familia was set. It is truly an astonishing building. You simply have to visit it. The ride to the top of the spire and very, very long spiral steps down took a fair amount of time and really added little to the overall experience. Folks with acrophobia probably should not attempt because the steps will be intimidating. Our guide was knowledgeable and had good language skills. Overall informative and enjoyable but felt rushed some of the time. Our guide was extremely knowledgeable. Unfortunately, the elevator in Sagrada Familia was broken so we couldn't go up to the top. Very disappointing. Viator is THE way to see Gaudi in Barcelona. Our guide was fabulous and I would recommend spending as long a time on a tour with Viator to see the most. Great tour. Learned a lot about Gaudì and his work and felt Teresa was very aware of us and very knowledgeable as well as kind, patient, cheerful and relaxed. Great day. Loved how there was some walking g but the bus took us to the top entrance of Park Guell. Thank you! The tour guide is fabulous. We had an almost private tour with a brilliant tour guide on April 10. She showed us everything and was also an expert on art history. Thank you!! Dan from Walks was amazing! His knowledge truly made the tour an unforgettable experience. We did not wait in any lines, allowing us to see an all the highlights of Gaudi in an efficient manner. We looked at many tours before booking this one and found it to be the most comprehensive. Our expectations were 100 exceeded.